Oct. 18 - For 17 of his 43 years, Crips co-founder Stanley Williams has called northern California's San Quentin State Prison home. As an inmate on death row (convicted of killing four people in two robberies), he has had nothing but time on his hands. It has been, he says, a slow, remorseful walk toward execution. After years of somber contemplation (including 6 1/2 years in solitary confinement), Williams has set out to reverse the rising tide of his bloody legacy. "I want to tell kids not to join gangs,'' he says from his 9-foot-by-4-foot cell. "You won't find what you're looking for. All you will find is trouble, pain and sadness.'' Both his message and his sorrow are expressed powerfully in "Life in Prison,'' a gripping new chapter book for young readers, ages 9 to 12. Though dozens accused Becnel of being blinded by a convict's "deathbed'' repentance, Morrow Junior Books eventually endorsed and contracted Williams' edgy book proposal. The haunting result - an 80-page, unflinching look at prison life - was released last month. So far, sales have been brisk. Rosemary Brosnan, executive editor at Morrow Junior Books, said recently, "I'm pleased to be publishing the book and hope that it will reach many young readers.'' Brosnan and Becnel are quick to point out that all of Williams' royalties have been donated to the Institute for the Prevention of Youth Violence. His motivation, they insist, is unselfish. Williams writes, "Right now, as you read this, you are probably free from incarceration. You may be unhappy at home and you may feel that you don't have a lot of choices in your life. But you still have the freedom to live a full life. 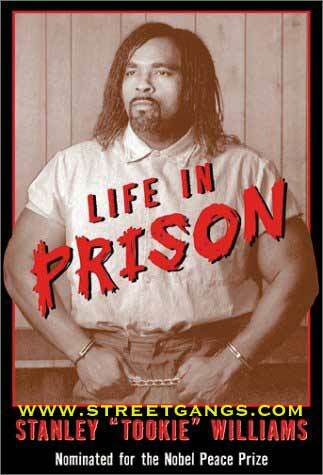 As an inmate, especially a death-row inmate, my life is very limited. There are so many things that I will never be able to do, so much that I will never see. The pain of knowing this is something I have had to endure my entire prison term. That message, said Becnel, is precisely the point. Kelly Milner Halls is a freelance book reviewer who is a regular contributor to the Chicago Tribune, Atlanta Journal and Constitution, Teen People magazine and the Book Report on America Online.